College is period of ever-expanding responsibility for students. Luckily, there are apps to help you that can make your life easier. If as a student you need help with your classes let’s say for finding a spot in your desired class, there are also apps made for these purposes. Using this kind of app can help you search for any class you like, find a spot or even sell your spot and switch with other student that likes to attend to it. We searched and have an app that can help. Let’s see what the app is about. What is Classeats all about? 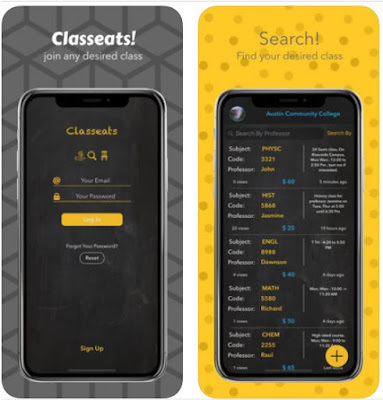 The Classeats is especially created for students as one very helpful and practical education app developed for IOS users, offering students to easily search for classes and find a spot in their desired class. On the app, users are able to communicate with other students in order to buy, sell or switch classes with students. The app causes revolutions at universities and it has the chance to become the business for students at colleges. Only made for all U.S universities and community college, the developer Nour helps students that registered in any class the option to sell their spot or switch with a student that likes to attend to it. This education app for students is offering all students easy to use features that will help them to easily search and join any desired class they like to, finding a spot in that class without much effort. With the help of the app, users are able to find a student that registered in the class they like to attend, a student that likes to sell his seat and the student in search can pay for that seat or simply switch classes with that student. The students can text and set appointments with students for classes. Users on the app can buy, sell or switch classes with other students in need. The classes that have a waitlist the user can make sure he is the first one on the waitlist before he even starts looking for seats and for the classes that don’t have a waitlist the student can meet in person with other students that like to drop so they can register first. The app allows users to rate their buyer or seller if they want to as well. The app allows users to search by using a professor name, class number, or subject to find the desired class on their college they like to join and attend. Download it on App Store for free now to easily find and join any desired class you want to!